Successfully Added Laser Effects Projector with Sound Activation (GOLD) to your Shopping Cart. 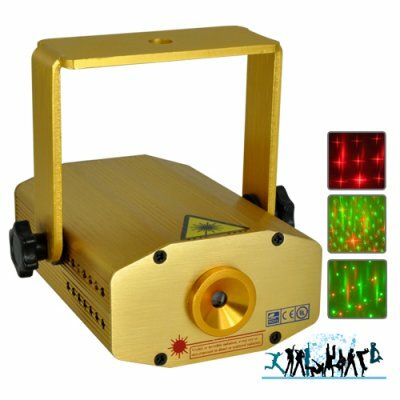 This gold colored Laser Effects Projector with Sound Activation is designed intelligently to beat to your favorite tunes thanks to the smart onboard MIC that picks up sound vibrations from the music and instructs the laser to display beautifully projected Red and Green colored patterns on your walls, ceilings or floor in sync with the beat of the music. This Red and Green laser projector is designed with two cool functions that are: Automatic, meaning leaving the laser on constantly and random visualizing patterns will constantly be emitted, or you can select the sound activated option and you can let your music activate the lasers with every beat. This is the coolest feature by far. Leave it on, and when you play your music, turn up the beat and watch the laser respond in style. This Green and Red class 3B laser effects projector with sound activation comes in a metallic gold aluminum finish with a single laser projecting output point emitting both Green and Red lasers that display beautifully designed patterns which makes it perfect for any retail or partying environment, plus it adds that little extra flare that is always needed when wanting to impress your friends, guests and family. This brilliant home music laser projector gadget is in stock now and available to you at a low China Wholesale Price . So click "Add to Cart" right now and we'll express ship your order so you can start enjoying those home and office parties even more than before with this cool Laser Effects Projector with Sound Activation. The lasers can easily project their beams 30+ meters inside smokey bars and still have strong visibility.